Currently showing in Kirkby Gallery is the 18th Annual Knowsley Open Art Exhibition, with over 250 creative works from local artists of all ages who live, work, study or volunteer in Knowsley. To make this year’s exhibition all the more exciting, the artworks will be sold at a live auction conducted by celebrity auctioneer Adam Partridge, with a percentage of the proceeds going towards the Friends of Kirkby Gallery and Prescot Museum to support their work. 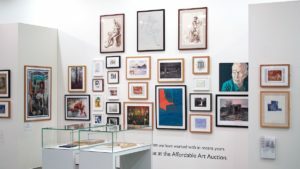 A fun opportunity to purchase an original artwork from the auction, which also features work donated by our artist friends including Willy Russell, Mike Kirby, Philip Garrett, Gill Cowley, Anthony Ratcliffe, and Paul Romano – to name but a few! An RSVP only event, please contact Tina Ball (0151 443 5617 / 4936, tina.ball@knowsley.gov.uk) to book your place.